As the years go by, it's inevitable that the role of Primary Administrator will change hands. If this time has come for you, we thank you for your service! We also have a few tips for making a smoothe transition to your incoming volunteer. Review the Contact Name under Parent Portal Setup / Web Home Page. Pass your login credentials on to the incoming administrator. First, consider creating a static email address to stay with this role going forward, such as admin@yourparentgroup.org or yourparentgroup.admin@gmail.com. This will simplify website and email edits needed for future transitions. Change the Admin Email address under Account Settings / Admin Users. 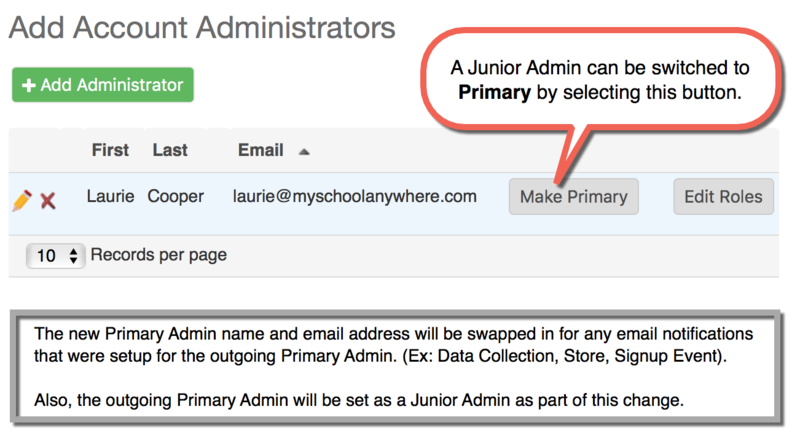 First, ensure your incoming primary admin is setup as a Junior Admin. Then, select the Make Primary button for that user. This will also swap out the new admin contact information to receive any notification emails that were setup for the outgoing primary admin. In being removed as the Primary Admin, you have just been swapped into a Junior Admin role. If you won't serve in that capacity, remove yourself as a Junior Admin. Review and update the Contact name parents see in your Parent Portal - Parent Portal Setup / Web Home Page. Arrange updates to your parent group website for the contact email address listed for MSA support/directory questions. Advise the incoming admnistrator to edit the "From" email address when reusing existing admin emails in your MSA system. Advise the school office what new email address to use for directing parent questions regarding the MSA system / Directory registration. Leave the Training to us! Our Classes and Back-to-School Guides are the ideal tools for bringing an incoming administrator up to speed and guiding him or her through your annual rollout. Be sure to introduce these tools as their starting point and let us do the teaching for you!